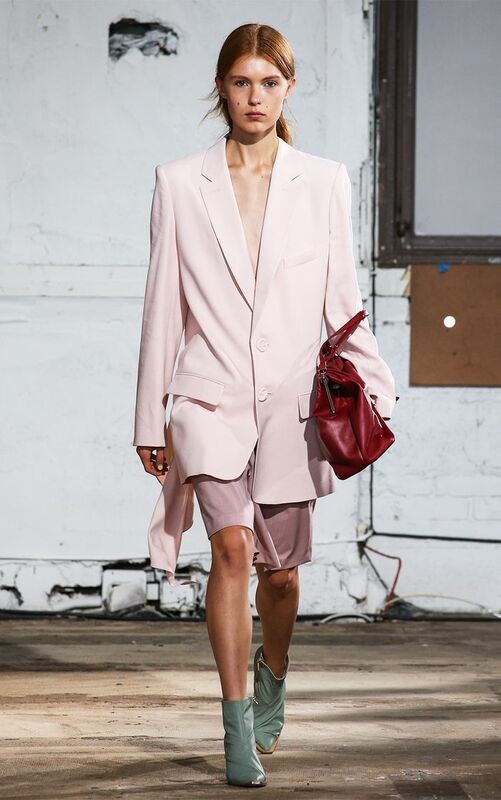 One of the most noteworthy spring 2019 trends is one we were quite shocked to see on the runway show after show. After quite a hiatus, shorts of all kinds are finally making their triumphant return. Brands like Tibi and Prada opted for a more tailored and lengthier approach to the trend while Chanel and Fendi stuck to the bike short phenomenon (yes, it's officially a phenomenon, trust us). No matter which style tickles your fancy, we can guarantee this trend is one you'll see sweep the sartorial nation. Below, we've rounded up all the shorts spotted during the S/S 19 shows. While yes, shorts as a trend is the overall takeaway, the microtrends are worth celebrating as well. Basically, there will be no short left behind on our watch. Go on to see our favorite spring 2019 shorts looks and to shop the best versions of each. Long shorts, something that was once considered taboo, are now extremely chic. Pair them with a tailored or structured top for a look to remember. Just when we thought the bike short trend wouldn't last, we saw a resurgence of it on the S/S 19 runways—even from powerhouse brands like Fendi and Chanel. And we all know that when Chanel deems something cool, we all follow suit. Surf culture is officially a thing. It's chill. While real surfers and tropical prints graced the runways, tropical shorts had our hearts itching for warm beachy days to come. Call them cargo shorts, call them utility shorts, we don't care so long as you wear them. Designers paired the shorts trend with everything from soft counterparts like breezy blouses to a head-to-toe utility-inspired look. And now, probably the most conventional trend of the bunch: denim shorts. Distressed, tailored—you name it—there was no denying the remaining presence of denim shorts this season, not like you wouldn't wear them anyway. They're a classic. Next up, check out all the best shoe styles currently available at Zara.